Red wine, grass, blood, dirt, and pets can all create carpet stains that are extremely difficult to remove by conventional means. With the proper timing and effort, it’s possible to get rid of the majority of these stains, but in most cases your carpet will retain some of the offending material even after you’ve cleaned it. Not to worry! Alamo Steam Team technicians are equipped with specialty gear that will remove bothersome set-in stains throughout your home. Get started with carpet stain removal from San Antonio’s top-rated cleaners today. You can even book an appointment with our San Antonio carpet cleaners online. Set-in stains can be an eyesore. Don’t bother exhausting yourself to only remove part of a bothersome stain. Call Alamo Steam Team to get the job done, while you relax! CAN SERIOUS CARPET STAINS BE REMOVED? Carpet stain removal can be extremely tricky. First of all, whenever you get a stain, especially if it has just happened, don’t panic. The best thing to do is try to minimize the problem by using clean paper towels or a clean white cloth to blot as much of the wet spill or stained area as possible. If you use a wet cloth, use cool water because warm or hot water will usually help ‘set’ stains even faster. Like many homeowners, the first thought after a troublesome spill is to rummage around under the kitchen sink, in the pantry or garage for whatever powder, spray or liquid cleaner that they think might work on their ugly stain. However, this moment of panic and the search and destroy mission may not be such a good idea after all. DIY STAIN REMOVAL CAN MAKE THINGS WORSE! When people incur a bad stain on their carpeting, it can touch a nerve like no other situation in their home. You can easily vacuum to remove dust, clean leather furniture to make it shine, wash windows to make them sparkle or clean a bathroom sink, but carpet stains are really on another level in the realm of house cleaning. For some common stains, such as red wine stains, we can offer you some tips — but in general, when it comes to removing carpet stains you need to proceed very cautiously. Often, a person’s first instinct is to grab some handy ‘cleaning’ item like a spray bottle of general liquid cleaner, some household detergent or perhaps even a pre-wash clothes additive. 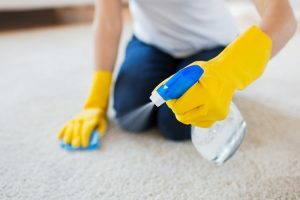 You may know what stained your carpet, but you may not know what your carpet is made of, the manufacturers cleaning suggestions, or worse, exactly what chemicals are in the ‘cleaner’ that you are planning to try on the stain. Any of these factors could proceed to make the stain even worse because you may be adding some unknown chemical to the stain, embedding it or helping it to set more permanently. If you think it looked bad when it happened, just make one hasty decision or mistake, and you’ll really have a problem on your hands. If you at least blotted the stain when it was fresh, and you haven’t made things worse by trying to ‘do it yourself’ with some store bought cleaning products, then all is not lost. Your San Antonio carpet cleaners have seen and dealt with every possible kind of carpet situation, and then some. First of all, a professionally trained technician will determine exactly what your carpets are made of. This one critical factor is one of the most important things to know. Based upon the fiber, the technician will make a decision regarding what the best process might be to remove the stain and to properly restore your carpeting. Perhaps the fibers in your particular carpet will respond to a biodegradable enzyme that will loosen or dissolve the stain. Maybe the stain can be treated with one of our eco-friendly pre-treatment solutions which can break the stain and wick it to the surface for easier removal. Whatever the method we use, and to insure that the carpets are totally cleaned and sanitized afterward, your local professional carpet stain removal service will likely suggest that your carpeting be steam cleaned. Here’s the most important thing to remember when dealing with tough stains: absolutely nothing on the planet will ever clean carpeting as deeply, thoroughly and restoratively as your local professional steam cleaning service. And when it comes to stains – from the most common carpet stains to even the most disastrous – if you’re in San Antonio then you’re in luck. We can even treat your carpets with Scotchgard, which will go a long ways towards preventing future mishaps. Contact Alamo Steam Team today for reliable carpet stain removal that will have your floors looking like new!